Today, Sega made official what we first told you last week: The Marine-like character spotted in Sonic Boom is in fact not an updated Marine character design, but an entirely new addition to the Sonic universe for Sonic Boom. Sticks, a jungle badger according to Sega’s release this morning, will be utilized across both the Boom game and TV series. Nika Futterman, who has lent her voice to a wide variety of TV shows and video games, will voice Sticks. It is not the first time Futterman has worked with Sega; her IMDb profile reveals she also voiced Mizrabel in last year’s Castle of Illusion Starring Mickey Mouse. Sticks is a significant addition to the Sonic Boom universe and the Sonic the Hedgehog franchise. She brings a quirky personality and perspective to the team dynamic, and we look forward to sharing this energetic and funny new character with the world. Sega’s full release is below, followed by a 2 minute video Sega released today to explain Sticks’s role in Sonic Boom and the Sonic universe. Tell us what you think of the new character in the comments. In advance of the highly-anticipated launch of Sonic Boom, the newest branch of the Sonic the Hedgehog universe announced earlier this year, SEGA is pleased to unveil Sticks, a brand-new character that will play an integral role across all Sonic Boom platforms. 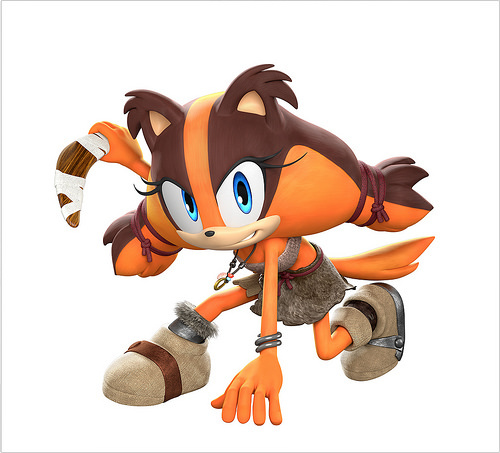 Sticks, a jungle badger who has spent most of her life living alone in the wilderness, will appear in the Sonic Boom TV series, Wii U and Nintendo 3DS video games, and merchandise, forming a common thread across all iterations of the new Sonic Boom world. Sticks joins Sonic, Tails, Knuckles, and Amy to form the core ensemble featured throughout the Sonic Boom franchise. The Sonic Boom television series, coproduced by SEGA of America Inc. and OuiDO! Productions, will debut on Cartoon Network in the U.S. and on CANAL J and GULLI in France during the 2014/2015 season. Every episode starts from a small character-driven story and explodes into an epic tale of saving the world, robot battles and more. Serving as a prequel to the stories revealed in the TV series the Sonic Boom video games will deliver a totally different experience to previous Sonic games with collaborative gameplay at its core. Developed in the U.S by California based Big Red Button Entertainment (Wii U) and Sanzaru Games (Nintendo 3DS) in collaboration with Sonic Team, this is the third title to be released as part of an exclusive deal with Nintendo. Sonic Boom will take advantage of the innovative hardware of both the Wii U and Nintendo 3DS, with traditional elements of Sonic games, such as speed, also featured. The videogame will also introduce exploration, combat and a new Enerbeam tether mechanic that will allow the Sonic Boom world to be discovered in totally unique ways. Sonic Boom will be supported by a robust global licensing and merchandising program, anchored by master toy partner TOMY. TOMY’s line will showcase the new character looks, stressing interaction between core characters, and will feature new play patterns based on both the new games and TV series. TOMY will develop a comprehensive toy range across a broad number of categories including plush, action figures, RC, role play, vehicles and novelty. Sonic fans can expect a high-quality, collectible toy line fueled by TOMY innovation and energized with speed, lights, sounds, motion-activation and action-performance. Sonic the Hedgehog first appeared as a videogame character in June 1991 and instantly became an icon for a generation of gamers. Defined by his super-fast speed and cool attitude, in the years since he first raced on to videogame consoles Sonic has become a true global phenomenon with over 140 million videogames sold or downloaded worldwide across consoles, PC’s, mobile phones and tablets. SEGA’s iconic blue blur has also gone on to enjoy incredible success in many licensed areas, such as toys, apparel, comics and animation. 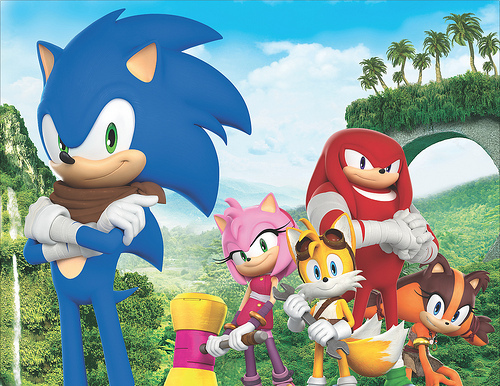 Executive producers on the Sonic Boom TV series are Evan Baily, Donna Friedman Meir and Jane McGregor on behalf of SEGA, and Sandrine Nguyen and Boris Hertzog from OuiDO!. Bill Freiberger is Co-Executive Producer. Other partners involved in the TV series include Lagardère Entertainment Rights for distribution for TV and Video and Lagardère Active TV Licensing & New Business for licensing and merchandise in France.